Saint Jean Baptiste Church is a spectacular Roman Catholic church on the Upper East Side of Manhattan, at 76th Street and Lexington Avenue. The church has one of the best websites I have seen with substantial detail on the history and architecture of the church. I summarized information from the website in this gallery. I took this photo of the festively decorated high altar during the Christmas season 2012. I took three exposures at f5.6, 100 ISO, with shutter speeds ranging from 0.8-13 seconds with a Canon 17-55mm lens. Post-production, I used an HDR process for one exposure and laid that exposure on a properly exposed photo in Photoshop Elements. I then adjusted the opacity slider to achieve the right mix of the two exposures. In the early 1800s, about 10,000 of the 90,000 people living in New York City were French-speaking. Among the French in New York City, Catholics were in the minority as most were Huguenots, émigrés of the French Revolution. Bishop de Fobin-Janson, on a missionary tour to the U.S. for the Fathers of Mercy, encouraged the French living in New York to start a church as had the Irish and Germans. 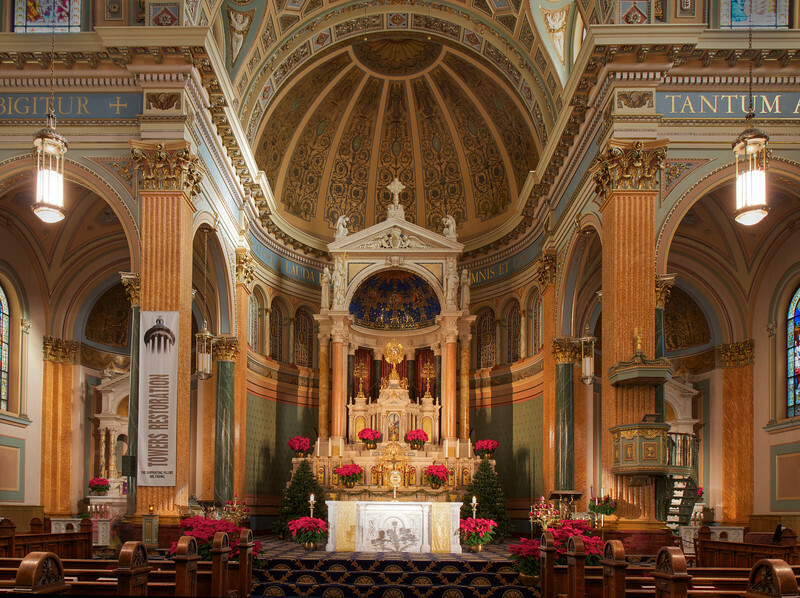 The community responded by opening the Church of Saint Vincent de Paul in 1842 on Canal Street. The congregation grew and moved to 23rd Street in 1868. However, the growing French-Canadian community in the Yorkville section found it difficult to make the trip downtown either by slow moving horse-drawn trolley or the more expensive Harlem Railroad. A French missionary, Father Nicholas, believed that services closer to Yorkville would be beneficial to the community, similar to what the Jesuits formed at what is now Saint Ignatius Loyola for Yorkville’s German population. The church received support to establish a national parish; a meeting of the Societe Saint Jean Baptiste was held and $12 was collected. “This was just a drop, one might say, but the first drop of a rising tide of generosity that has never failed to flow from the parishioners and friends of Saint Jean Baptiste since that historical meeting in 1881,” according to the church website. This meeting is considered as the beginning of the church. A more permanent site was needed and the church was able to raise $14,000 to buy property at East 76th Street between Lexington and Third Avenues. Napoleon Lebrun designed the church, a simple Gothic style 100 feet long and 41 feet wide with seating capacity of 600. Ground was broken in 1882. Saint Jean Baptist was a success from the start as it drew large numbers of French Catholics and Catholics from other nationalities, possibly due to the convenient location near 5th Avenue; many church members were servants to wealthy residents of 5th Avenue who found it convenient to worship before reporting to work at an early hour. In 1886, nuns from the Congregation de Notre Dame, founded in colonial Montreal in the mid-17th century, established an elementary school. The school operated until 1969 when it was closed due to changing religious demographics of the neighborhood. The high school was opened in 1929 and continues to operate. The sisters are a familiar and beloved presence and are involved in many parish and Archdiocesan ministries, according to the website. In 1892 an unexpected event would enhance the prominence and popularity of the church-it became the shrine of Saint Anne. A Canadian priest, Father J.C. Marquis, unexpectedly arrived at the church on May 1, 1892 needing a place to stay. He carried a relic (piece of bone) of Saint Anne, which Pope Leo XIII had personally obtained from the Abbot of Saint Paul in Rome. Monsignor Marquis was bringing the relic to Quebec. The pastor at Saint Jean asked Marquis to expose this sacred treasure to the parishioners during the vespers that evening. He agreed. The news that the relic was to be exposed spread rapidly and a large crowd filled the church that evening. When the relic touched a man having an epileptic fit, his convulsions ceased. Miraculous or not, the apparent miracle was widely reported and even more showed up, with many expecting cures of their ailments. The church asked Marquis to continue the exposition of the relic; against his will but reluctant to disappoint the hopes of the pilgrims, he agreed to extend his stay in New York. Estimates of the number of people visiting Saint Jean’s during May 1892 was 200,000-300,000, some from as far as New England and Mid-Atlantic States. Despite the popularity of the relic, Marquis left for Canada on May 20. Marquis, impressed by the devotion of the crowds, he returned in July. More crowds came, more miracles were reported and Marquis reported favorably on this to the pope. As a result, he was able to make a return trip to the shrine of St. Anne in France, and brought a relic back specifically for Saint Jean Baptiste. Eliza Lummis, a wealthy Catholic activist brought the Congregation of the Blessed Sacrament, an international religious order of priests, brothers, and deacons founded by St. Peter Julian Eymard in Paris in 1856, to New York in 1900. Eymard’s mission was to encircle the globe with a network of Eucharistic centers or shrines. Blessed Sacrament priests were unable to find a center for their work, but often attended Mass and resided at the St. Jean Baptiste rectory. One day, the pastor joked to the Blessed Sacrament priests that if they could not find a church, he would just have to give them his. That remark got back to Archbishop Corrigan, who informed Saint Jean Baptiste's pastor the next day that he would take over Saint Jean’s, putting the church under the Congregation of the Blessed Sacrament's control. Prominent financier Thomas Ryan was a frequent visitor to Saint Jean’s. as he preferred the more humble church to the more imposing structures near his 5th Avenue home. He attended mass frequently; he was late one day and had to remain standing during the Mass in the overcrowded church. During the Mass, the priest asked the prayers for the erection of a new church. After Mass, Ryan approached the priest and asked how much would it cost to build a new church. The answer was at least $300,000; Ryan immediately agreed to finance the project. The site of the new church is the current location at East 76th and Lexington Avenue. Ryan took an active interest in the construction of the church, eventually contributing $600,000. Nicolas Serracino designed the church and won first prize in the International Exhibit at Turin Italy in 1911. It was designed in the Italian Renaissance classical revival style, with twin towers of 150 feet rising above the façade and a central dome soaring 175 feet above the floor level of the church. The blessing of the cornerstone ceremony took place in April 1912 as 9,000 people looked on. The opening of the lower church took place in February 1913. The upper church was dedicated in January 1914. Currently, Saint Jean’s has many ministries and programs. The congregation is a member of the Yorkville Common Pantry and the Neighborhood Coalition for Shelter. Saint Jean Baptiste High School for girls celebrated its 80th anniversary in 2009. The church runs the school in conjunction with the sisters of the Congregation de Notre Dame. Students come from throughout the city’s five boroughs. The church has a music ministry and two choirs led by its organist.